ow does a person become a leader? Some say people are born leaders while others contend that leadership is a skill you develop over time. But no matter how one achieves the status of leader, either through an innate talent or developed skill, the ability to communicate clearly and effectively is undeniably one of a leader’s most important abilities. Communicating effectively isn’t just about what you say verbally it is also what you say nonverbally. Nonverbal communication can be how you hold yourself, how much eye contact you give to someone, the distance you stand from a person or one of the most powerful of all, how you dress. How you dress not only affects how people perceive you it also affects how you feel about yourself. As a leader you want to “dress for success” as they say, wearing clothes that give a good first impression and make you feel confident and communicates that confidence to others as well. 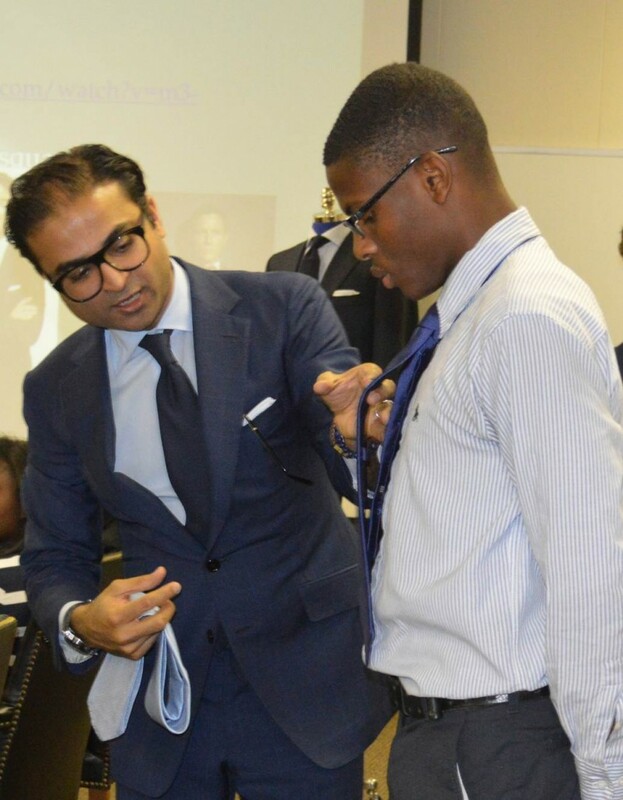 Last week Paul Quinn College got a special opportunity to hear Ed Shaikh, co-owner and operator of Hadleigh’s Bespoke, speak about leadership and how it can be conveyed through style. Ed Shaikh and his wife Gable started Hadleigh’s Bespoke in 2009. The name honors both their first child, Hadleigh, and the term bespoke which refers to items custom made to the buyer’s specifications. The store carries a selection of upscale attire from Ed and Gable’s own line as well as offers custom made and tailored pieces. Along with Hadleigh’s Bespoke Ed has also been a member of the Dallas men’s fashion scene for over 20 years, first with Ralph Lauren in Highland Park Village where he ranked third in sales and later with Stanley Korshak where he served as menswear buyer and top producer. In conjunction with his presentation at Paul Quinn College where he shared his wealth of knowledge and experience with the students there, Ed was kind enough to answer a few questions I had for him about his own personal way of dressing like a leader and what that means. 1. Growing up were you always aware of fashion and what people were wearing or did that come later in life? 2. You say that the love of fashion is in your blood. Is there someone in your family that inspired and developed that love? My father was the primary figure in my family that inspired me and allowed me to develop and explore my love of fashion—he taught me everything bespoke, from folding a pocket square to how to button my jacket. His tailor made my personal garments at the time as well. 3. Both your personal sense of style and the style of the clothing you create is very developed. Is there anyone in film or literature that you look to for style inspiration or that helps you conceptualize what you want your pieces to look like? In my opinion, we call our look the H-man look. It revolves around simplistic design with modern esthetic and most importantly: the perfect fit. Much of what inspires our designs comes from Hollywood, movies, and history. 4. Why did you choose to create custom clothing instead of just designing your own line? What about the custom clothing process makes you prefer it to just designing? At our shop we engage in both designing the product as well as creating custom one of a kind creations for our clients. We have a full ready to wear line, men’s and women’s, designed by myself and my wife Gable. And many of our design inspirations come from color pallets with historical significance and fabric textures and patterns. 5. 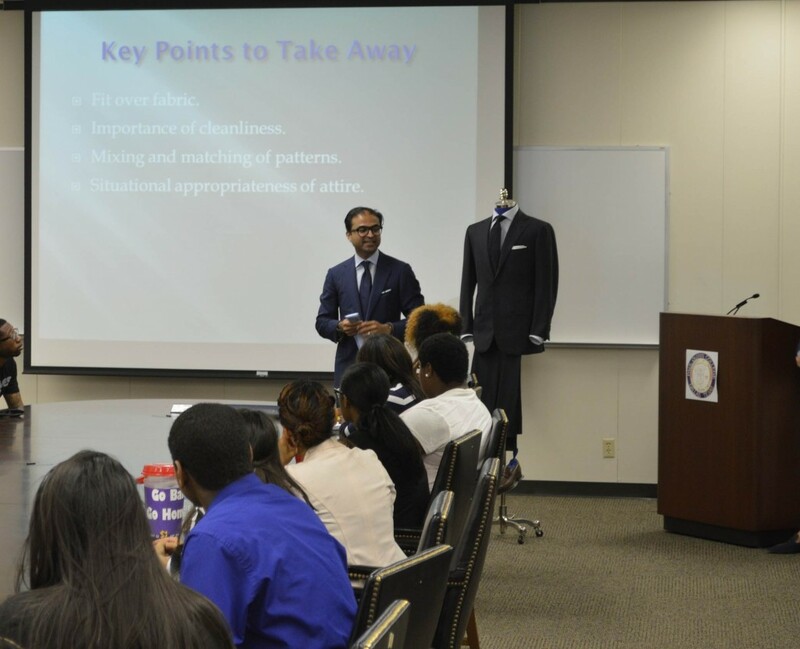 You recently held a workshop at Paul Quinn College on how to dress like a leader. What do you think dressing like a leader entails? Dressing like a leader, first and foremost, requires presentation of that leader from head to toe—meaning not just their attire, but how they carry themselves and interact with those around. Also, their body language plays a big role in this as well as proper accessories…all of these things work together to present what the first impression people see when upon meeting an individual. 6. What do you think is the difference between how men and women convey a sense of leadership through their styles and what are some good fashion choices for both when wanting to look like a leader? Primarily it is about how you look the part as a leader—looking as if you belong where you are. 7. You have many years of experience in men’s fashion. What do you think is the male version of the little black dress? What is the piece of clothing every man should have on hand in his closet? The key essential piece in one’s wardrobe that I find most important is a blue, modern fitting, blazer. 8. Is dressing like a leader something a person who wants to be a leader should do every day or only when they are actively leading? Dressing like a leader is something one should do on a daily basis, as per their lifestyle. 9. Is there any specific colors or color pallets you suggest for the clothing of a leader? The primary colors that a leader’s wardrobe should revolve around are grey and navy. 10. What is a particular outfit, clothing piece, or color that makes you feel confident as a leader? Blue and navy! A blue tuxedo is a great piece, blue suits, and a navy blazer.